This micro:bit activity guides the students to create a program with three variables that will keep score for their Rock Paper Scissors game. Tell the students that they will be creating a program that will act as a scorekeeper for their next Rock Paper Scissors game. They will need to create variables for the parts of scorekeeping that change over the course of a gaming session. 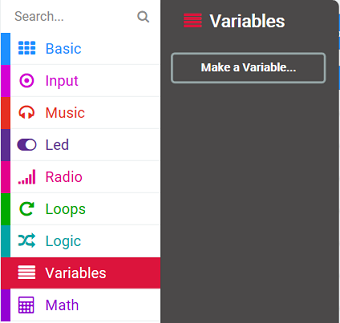 What are those variables? Creating and naming variables: Lead the students to create meaningful names for their variables. What would be a unique and clear name for the variable that will keep track of the number of times Player A wins? Discuss why (or why not) different suggestions make clear what value the variable will hold. In general, variable names should clearly describe what type of information they hold. 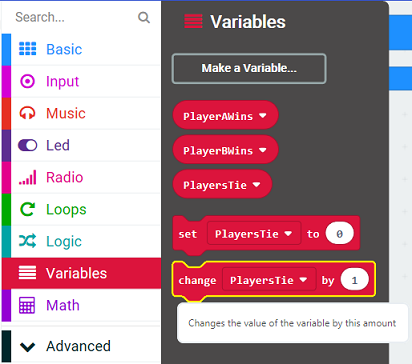 In MakeCode, from the Variables menu, make and name these three variables: PlayerAWins, PlayerBWins, PlayersTie. It is important to give your variables an initial value. The initial value is the value the variable will hold each time the program starts. For our counter program, we will give each variable the value 0 (zero) at the start of the program. In our program, we want to keep track of the number of times each player wins and the number of times they tie. We can use the buttons A and B to do this. We already initialized these variables and now need to code to update the values at each round of the game. Each time the scorekeeper presses button A to record a win for Player A, we want to add 1 to the current value of the variable PlayerAWins. Each time the scorekeeper presses button B, to record a win for Player B, we want to add 1 to the current value of the variable PlayerBWins. Each time the scorekeeper presses both button A and button B at the same time to record a tie, we want to add 1 to the current value of the variable PlayersTie. From the Input menu, drag 3 of the ‘on button A pressed’ event handlers to your Programming Workspace. Leave one block with ‘A’. Use the drop-down menu in the block to choose ‘B’ for the second block and ‘A+B’ for the third block. From the Variables menu, drag 3 of the ‘change PlayersTie by 1’ blocks to your Programming Workspace. Place one change block into each of the Button Pressed blocks. Choose the appropriate variable from the pull down menus in the change blocks. a ‘T’ for each time the user presses both button A and button B together to record a tie. We can display an ‘A’, ‘B’, or ‘T’ using either the ‘show leds’ block or the ‘show string’ block. In this example, we have used the ‘show leds’ block. Notice that we added a ‘clear screen’ block after showing ‘A’, ‘B’, or ‘T’. What do you think would happen if we did not clear the screen? Try it. 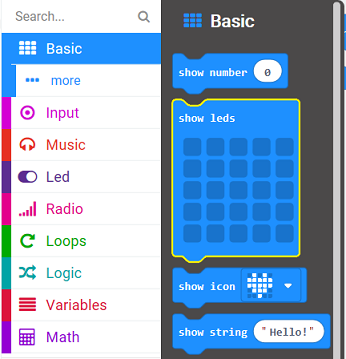 To finish our program, we can add code that tells the micro:bit to display the final values of our variables. Since we have already used buttons A and B, we can use the ‘on shake’ event handler block to trigger this event. We can use the ‘show string’, ‘show leds’, ‘pause’, and ‘show number’ blocks to display these final values in a clear way. Here is the complete program. Buttons have been used as human input devices since computers first existed. Watch this video and see how they let tell the micro:bit to do something. 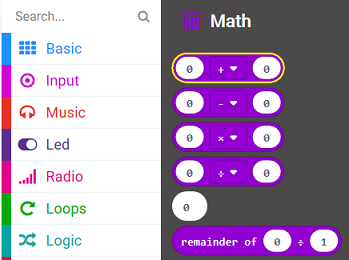 Download the Scorekeeper program to the micro:bit, and have the students play one last round of Rock Paper Scissors using their micro:bits to act as the Scorekeeper! There is more we can do with the input we received using this program. We can use mathematical operations on our variables. Example: Perhaps you’d like to keep track of, and show the player the total number of ‘rounds’ that were played. To do this, we can add the values stored in the variables we created to keep track of how many times each player won and how many times they tied. In order to do this, we can add the code to our program under the ‘on shake’ event handler. 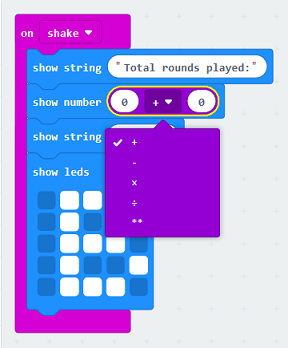 First, display a string to show the player that the following sum represents the total number of rounds played. Our program will add the values stored in the variables PlayerAWins, PlayerBWins, and PlayersTie and then display the sum of this mathematical operation. The blocks for the mathematical operations adding, subtracting, multiplying, and dividing are listed in the Math section of the Toolbox. Note: Even though there are 4 blocks shown for these 4 operations, you can access any of the four operations from any of the four blocks, and you can also access the exponent operation from these blocks. Replace the default values of zero with the names of the variables we want to add together. Notice that because we are adding three variables together we need a second math block. First we add the values for PlayerAWins and PlayerBWins, then add PlayersTie. Save, download, and try the program again to make sure that it runs correctly and displays the correct numbers for each variable. Remember that the micro:bit is a device that processes input and displays it as output in some way. By storing values in variables, you can perform mathematical operations on that data that provides you with useful information. What other math operations could provide valuable information from the values stored in these variables? Calculate and display a player’s wins and/or losses as a percentage of all rounds played. Calculate a display the number of tied games as a percentage of all rounds played.